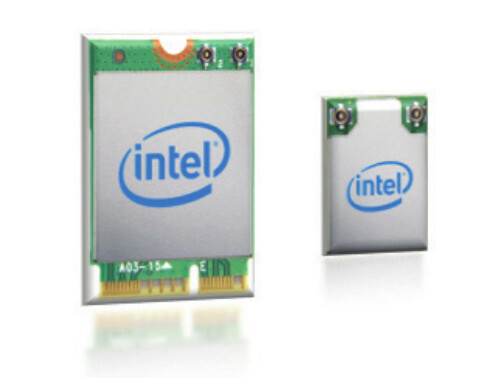 Last week, we saw that the upcoming Intel Gemini Lake processors integrated a CNVi (Connectivity Integration) block with a WiFi MAC, and Bluetooth MAC & Baseband Modem connected over a CNVio interface to a separate CRF (Companion RF) module handling the RF part. 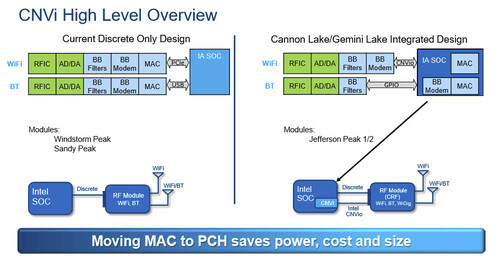 The design change is shown in the block diagram below with the old design on the left using wireless modules connected over PCIe and USB, and the new design on the right used in Cannon Lake/Gemini Lake processors which aims at saving power, cost, and size. Intel has been providing M.2 2230 and M.2 1216 wireless modules for a while, so there’s no direct space saving here with CNVi when using those modules, but they should still come with less components than previous design. We’ll have to wait until systems based on Gemini Lake or Cannon Lake start selling before being able to purchase Wireless-AC 9560 module, or see it bundled in computers or laptops. So does this mean that the M.2 2230 module doesn’t follow the M.2 standard? This would also mean that you can’t upgrade/sidegrade to a different M.2 2230 module if you for example are having problems with the Intel module (wouldn’t be the first time). Also, this pretty much prevent other manufacturers from supplying M.2 Wi-Fi modules to Intel based computers, so this seems a bit anti-competitive to me, unless the CNVio standard is opened up to everyone, like it was done with Ethernet PHY’s when Intel integrated the MAC into the chipsets. Oh, one more thing, this also means that the MAC address for your Wi-Fi is tied to your computers UEFI from now, rather than the Wi-Fi card itself. I could not find any details about CNVio while writing the article, but the product brief still lists USB and PCIe interfaces for the M.2 cards. Gemini Lake is looking better and better with every announcement. I’m sure that even if Intel will initially be seen to buck the trend with regards to any variation, other manufacturers will eventually get to manufacture their own variations. I just pray that Intel doesn’t decide to so anything to screw things up and turn a potential victory into defeat. It’s long overdue for their products to adopt HDMI CEC as a basic standard across the range as well. Will the Intel 9560 with older systems ?